Non Residential Personality Development camps were held from 21st May to 3rd June, 2016 at 9 places of Nagpur. Children enjoyed the games, patriotic songs, SuryaNamaskar and stories along with chanting of Stotras. They also learn to make different things in craft session. This year the theme was ‘Love towards Motherland’ and the stories told to the children were on cleanliness, environment, fearlessness, regularity, hard work and self-confidence and they were oriented towards the theme. The team of young karyakartas of the age 14 years to 17 years, made this camp successful. 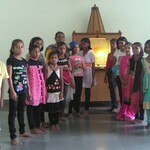 284 children participated in these camps.